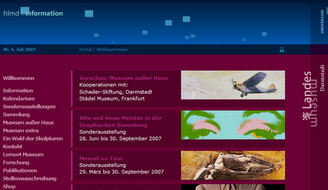 The “Hessisches Landesmuseum Darmstadt” (museum of the state of hesse) is the central museum of the state and tries to keep up a universal knowledge approach building on the unity of Science and Art. They host exhibits from numerous different scientific and artistic disciplines all under the roof of the beautiful building created in 1906 by Alfred Messel, right in the center of Darmstadt. 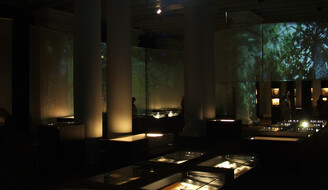 Side by side with the permanent exhibition there are always temporary special exhibitions about a specific topic. All of which makes the museum worth a visit for both younger and grown up audience. MESO Web Scapes is proud of having been asked to redesign the website of the traditional and famous institution in 2005 as well as creating a media installation for a traveling exhibition. 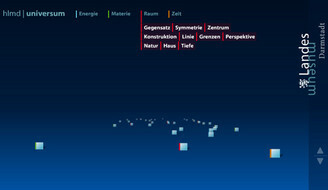 A virtual universe for a universal museum: the Universe, part of the website of the “Hessisches Landemuseum” (museum of the state of hesse), invites curious website visitors of any age to find and follow unexpected cross relations between exhibits from different departments.